After 4 days of solid cloud and rain, the sun broke through briefly on the evening of Sunday 9 September 2007 and we got our first shot of the trip near Krasna Studanka. In glorious light, 753 187 rolled towards Liberec with train Os6325 from Frydlant v Cechach. 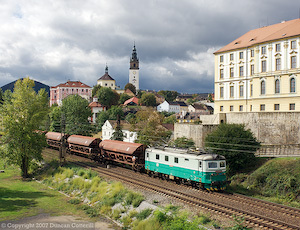 The Usti nad Labem - Lysa nad Labem line runs through the picturesque town of Litomerice on the east bank of the Labe (Elbe) River. 123 006 hauled a southbound freight past some very fine buildings during a brief sunny period on 11 September 2007. This report covers a short photographic trip to the Czech Republic with Chris Wilkinson. We flew to Praha with CSA and hired a car as the lines we intended visiting have awkward gaps in the passenger service. Our base for the trip was the Hotel Imperial, just down the road from the station in Liberec. This line forms the northern part of the main freight route between the western Czech Republic and Poland. It’s one of the last freight corridors to remain diesel worked and runs through very attractive country on its way from Liberec to the Polish border station of Zawidow. Liberec depot continues to roster a handful of class 753 diesels on these services, several years after the class disappeared from the rest of the Czech system. These are usually far less interesting than the freights. Services on table 037 have been operated by railcars for several years, although locos do still turn up to cover failures. This year has seen a major change in the structure of the service with trains running to an hourly regular interval pattern and crossing at Raspenava. On weekday mornings and for much of the day at weekends the service is reduced with two-hour gaps between trains. Most of the Liberec – Frydlant trains were booked for class 854 units earlier in the year but 3-car class 814 sets have now taken over most services with the occasional 810 also putting in an appearance. Over the weekend only one 814 set was working on the line. On Saturday an 854 covered most of the other workings while on Sunday 753 187 did the honours. 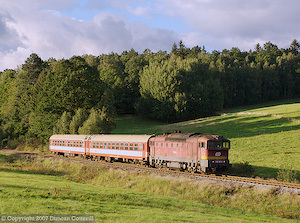 Trains from Liberec connect with Frydlant – Cernousy services, which are booked to be worked by single class 810 railcars. We didn’t actually venture north of Frydlant so can’t confirm that this is still the case. The 814 sets seen comprised . . .
814 201 + 014 001 + 814 202 & 814 203 + 014 002 + 814 204. The regular interval passenger service has imposed a degree of regularity on the freight operation as well. When the full passenger service is running there is a path for a freight in one direction or the other every hour. During two-hour gaps in the passenger service there are obviously more options. Freights in either direction tended to cross passengers at Mnisek u Liberce and/or Frydlant. In general, trains went north before 14:00 and then returned during the afternoon. Freights generally ran in the booked freight paths but not necessarily in their own paths. For instance Nex47204, the northbound car train, often ran two hours early in the path of Pn47214, the mythical limestone train. Traffic wasn’t particularly heavy, averaging about two main line freights each way per day plus the pick-up on Mondays to Fridays. Most freights are booked for class 742s, usually in pairs, but Liberec often turns out its class 753s instead. Discounting the pick-up goods, which was worked by a class 743 as booked, we saw 11 freight workings north of Liberec during our trip. Four were worked by pairs of class 742s and seven by single 753s. This is a change from previous practice where the class 753s also usually worked in pairs. 753 073, 753 141§ 753 187, 753 211, 753 301. § = 753 141 was not seen working, only on shed at Liberec. We spent a few hours on this line on the Sunday and found class 854s on some of the local services as well as most of the fast trains. Several locals were worked by the expected class 810s but Os6608 turned up with 749 258 on three coaches. On Monday 753 187 was seen at Liberec on R696 to Usti nad Labem. Monday morning dawned dull and grey with a forecast of more rain. Another day sitting in the car watching the rain lash down didn’t appeal so we opted for a day trip to Praha instead. There are no direct trains from Liberec to the capital but the two-hourly Liberec – Pardubice fast trains connect with two-hourly trains to Praha at Turnov, making the journey relatively easy. Although these trains are classed as fast, they are anything but, taking over two and a half hours to cover the 143km. Liberec – Pardubice trains are booked for class 843 railcars with class 854s working the Tanvald – Praha services and that was what we got. Apart from 810s on some local workings all the passengers we saw were operated by these classes. There wasn’t a great deal of freight around and every train that we saw was worked by class 742s including a very heavy Pn63400 at Hodkovice with a pair of 742s on the front and another pair on the rear. The usual classes of electric loco were seen around Praha. In contrast to table 037, this is a very busy electrified freight route, carrying most of the international traffic from Germany (via Bad Schandau/Decin) as well as coal from the mines west of Usti nad Labem. We stopped off at Litomerice on our way back to Praha airport and saw about 10 freights and 5 passengers in less than two hours by the lineside. The passengers were hauled by class 163 electrics with the exception of two short workings (Os 6463 & 6464) that produced a class 460 EMU. The freights were all hauled by older electrics of classes 121, 122 or 123. It's worth noting that the 47 year old class 121s (freight version of the 141) seemed particularly active with two examples seen at Litomerice and another at Vsetaty on our trip to Praha the previous day. This was a very disappointing trip due to the appalling weather. The sky was completely overcast most of the time and it rained for hours on end. We only got around one hour of sunshine in almost 6 days, far less than the climatic average for early September, which is around 6 hours per day! It was Sunday afternoon before we got our first shot and it looked like that was it for the trip until the clouds briefly parted at Litomerice on the way back to Praha on Tuesday afternoon. It’s remarkable that Liberec still manages to turn out class 753s on a regular basis so long after the class disappeared from the rest of the Czech system. I thought I’d taken my last picture of a real working 753 in autumn 2005 but they’re still going two years later. The reasoning behind the change from double heading to using single engines is unclear but the old Brejlovics seemed to be up to the task. Freight traffic volumes on the Liberec – Zawidow route have always been variable and what we saw was fairly typical for the route. It was only the persistent cloud cover that stopped us from getting some very worthwhile pictures. Passenger services around Liberec were very unpredictable and it sometimes appeared that anything could turn up on any train at any time. The two class 814 sets effectively displace three class 854s on the Frydlant services as the driver only has to change ends at Liberec instead of having to run the power car round the trailers. This allows the same unit to return north after a 5 minute turnround instead of laying over for 1 hour and 5 minutes before going back to Frydlant. Despite this increase in efficiency and the ability to use the displaced class 854s elsewhere, there was still a regular requirement for loco hauled substitutions, particularly on the line to Ceska Lipa and Decin. The Liberec area may have lost all its booked loco hauled passenger workings in recent years and freight volumes may not be high but it’s still well worth a visit due to the rarity of the class 753s, the superbly photogenic lines in the area and a good chance of getting loco hauled substitutions.